Not too long ago, I was teaching nonfiction text structure to my students. In reality, it can get a bit boring, and I felt I needed to spice it up a bit to engage my students. After we discussed each type, I modeled on my whiteboard reading short paragraphs and sorting them into the correct categories. I did a think aloud about how I noticed that this text seems to be doing this and that. After practicing a few times as a group, I eventually moved into individual sorts. I used the FCCR* text structure pages. 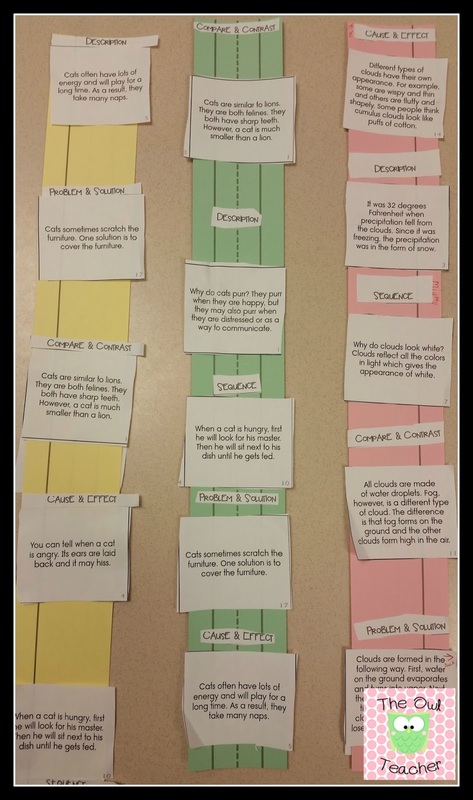 I provided each student with a sentence strip, a copy of the FCCR* page of paragraphs to sort, and headings for each type of text structure. Then I had students cut them out, sort each paragraph under the proper heading, and glue it. I also used a variety of the paragraphs from FCCR*’s site to mix it up a bit. It may not be the most beautiful project, but it seemed to work. After we explored text structure with just paragraphs, we moved into full texts by exploring various magazines that pile up in my room- Time for Kids, Storyworks, Scholastic News, so on. I was very impressed with how well they picked it up and even now, when we aren’t focusing on text structure, someone will still point out the structure of the text we are reading. Those are the moments that you feel you did your job wonderfully! « MTM: What If You Had Animal Hair? What a great way to use those passages!! 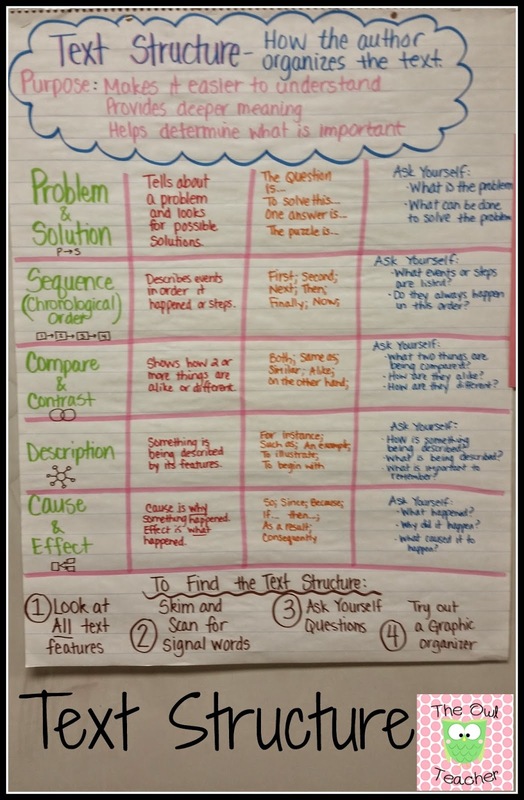 Thank you so much for sharing my resource in your blog, Tammy! What an awesome surprise! I went to the FCCR page to look for the paragraphs that you used on the sentence strips, but was unable to find them. Where can I get those? Love the idea! I am very sorry. I didn't realize I had linked you to the wrong set. I have put in the correct Link above. You will click on the hyperlink attached to the FCCR page. A pdf should open. When it does, they are pages 39-41. If that doesn't work, email me and I can email it to you. 🙂 Thanks again! Have fun!